Cheap flights Berlin-Barcelona for only €48! Easyjet now offers bunch of options how to visit Barcelona for good price. 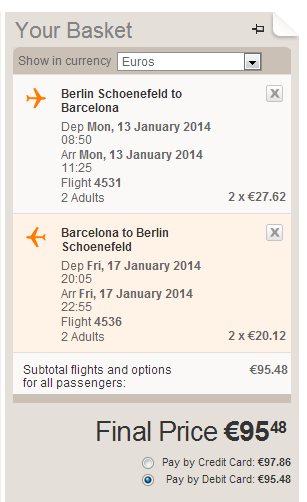 Return flights from Berlin to Barcelona are available for only €48. To get this price, you have to travel in couple or more and take cabin luggage up to 55 cm with unlimited weight with you. Other dates are just slightly more expensive. « Cheap flights to Portugal: Prague-Lisbon for €110!